By choosing a Q-Connect HP 307A Toner Cartridge (OBCE742A), you get exceptional print quality at a great cost-per-page - just what your business needs. 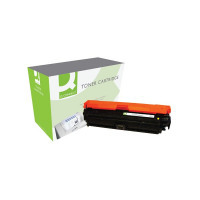 Compared to original HP cartridges, this Q-Connect HP remanufactured alternative provides quality printed text and images that a standard that meets or exceeds the genuine article, but at a far more cost-effective price. It's ideal for businesses looking to cut back on spiralling print costs. This item boasts an exceptional 7,300 page yield.